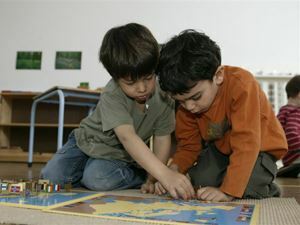 Between the ages of 3 and 6 the Montessori environment is called the Children’s House. Children coming from an Infant Community move into this environment between the ages of 2 ½ and 3, as and when they show they are ready. The three-year age range in the Children’s House means that it forms a mini community in which the younger ones can learn from watching what the older ones do and the older ones increase in confidence and reaffirm their own knowledge by helping the younger ones to carry out activities. The rules of the community depend on respect – respect for each other and respect for the things and activities they all share. The way the environment is laid out requires that the children put things back on the shelves ready for someone else to use and the fact that there is only one of each piece of material helps the children develop patience and self-control. Materials are interrelated so that one child may be cutting fruit up because they want a snack but another may be washing up, another washing cloths and another ironing – all activities for their own sake and yet all activities that serve the needs of another. The capacity to share and work collaboratively with each other emerges as a natural consequence of the way in which the community functions together. The Children’s House environment is laid out in a way that helps children to choose and access their activities for themselves so that they are able to follow their own developmental timetable. 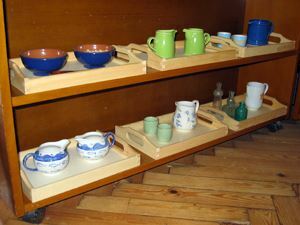 All of the materials are child-sized and are placed on low shelves in an order that children can see what is there and judge what they might be able to do next because of its position on the shelf. Having chosen what they want to do children may engage in an activity for as long as they want to, exploring and finding things out for themselves. Materials are self-correcting, children can find out when they have made a mistake and work independently to solve problems without having to ask for the teacher’s help. Activities are offered in a way that appeals to the way that the child under six learns – as hands-on activities that the child can explore using all of their senses. The Montessori teacher introduces the children to activities as and when they are ready by showing them what to do rather than telling them what to do because at this age children learn more from what adults do than from what they say. The mixed age range also allows children to absorb what older children are doing and because of their absorbent minds this acts as a lesson in itself. Many materials are delicate and breakable, which helps the child to handle them carefully discovering that failure to do so results in breakages. Often flowers are strategically placed on tables to help the child realise that he has to pass by with care and this gives him much more efficient feedback to check his movements than a teacher’s admonition to ‘stop running’ would do. At first many activities are offered individually because young children like to do things by themselves but as the children get older and their needs change they are offered games, in which they can interact, co-operate and share their understanding. 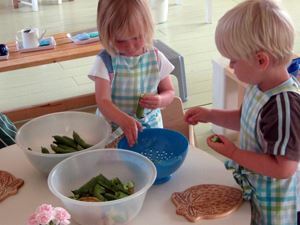 When children first come into the Children’s House they are offered activities that appeal to their need to gain control over their bodies – everyday life activities which include how to look after themselves and their environment – doing up buttons and zips, pouring a drink and cutting up fruit, folding cloths and washing dishes. Through these activities they learn how to use their hands productively to do what they want to do and how to set about tasks and complete them. This gives them some confidence in their capacity to do things and encourages them to think about what else they might try doing. They gain the ability to persevere, to concentrate, to set about a task in a logical way, to be in control of their actions and to think for themselves. Children with such character traits are able to apply themselves to anything they want to do in life – if you can concentrate and think something through logically you can do mathematics and learn to read and write. If you can persevere and are in control of your body you can play football or learn to do ballet. The children’s House is filled with brightly coloured beautiful, scientifically designed, aesthetically pleasing materials – the shelves entice the child with boxes full of beads, crafted wooden shapes and delicate, ceramic jugs and bowls. The Sensorial materials are designed to help train the child’s senses to see the world in a different way. The child learns to perceive differences in size, shape, colour, texture, temperature, weight, smell, taste, sound and pitch so that he becomes aware of these differences in the world around him. The activities that he is offered help him to learn how to explore in a scientific way – to be able to compare, contrast, sort and discriminate the finest of differences between things. He uses these skills to learn how to read and write, understand the world of numbers and to learn about the animals, plants, music and art in the world around them. All of these activities are offered through hands-on concrete materials that help the child to access abstract ideas such as the decimal system and the phonetic code because they are offered through his senses to a mind that absorbs with ease and has been prepared to explore. To prepare an environment to fulfil the needs of the child. To connect the child to the activities in the environment and then. To make it possible for the child to be engaged in activity without being disturbed for as long as he needs to be. The main tool that the Montessori teacher has for this is the skill of observation – observation lies at the heart of the Montessori approach to education. 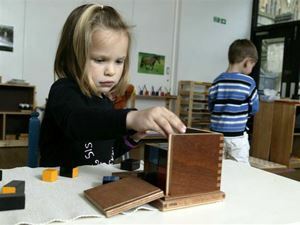 The Montessori teacher must observe to find out what the child chooses for himself, what he spends time focusing on and how he manages with it in order to find out what interests are driving the child’s development at a particular moment and what help he needs. These observations are used to decide what to offer the child next and how to help the child progress. 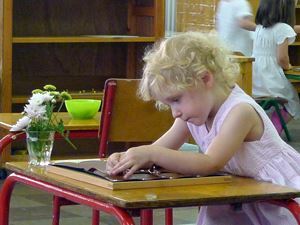 When connecting the child to activities the Montessori teacher is both lively and enticing but once the child is engaged she is passive and retiring. This scientific approach to observation helps the Montessori teacher to guide the child to follow his own developmental timetable. So in the relationship between teacher and child, both are the guides – the child is guided by the teacher and the teacher is guided by the child.